View of Wick, near Bath, also known as Bathwick. The National Gazetteer of England and Wales of 1868 notes "[the] parish in the hundred of Bath Forum, in the county of Somerset, forming the eastern suburb of the city of Bath. It lies on the east side of the river Avon, which is crossed by two fine bridges, one of stone, the other of iron-connecting the parish with Bath. The Great Western railway, the Kennet and Avon canal, and the Warminster turnpike road pass through it. Bathwick is believed to have formed an important part of the old city, and it contains now some of the best streets and most elegant buildings of the modern city, including Sydney-place and Gardens, Laura-place, and Pulteney-street. One hundred and fifty years ago the district near the river was little more than a marsh, often flooded, and with a few houses scattered over it." 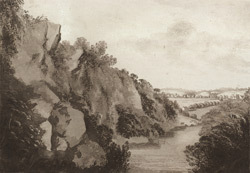 This is one of six views of the local area made for Caleb Hillier Parry (1755-1822) a noted Bath physician, agriculturist and geologist. The artist is John Sanders Jnr (1750-1825) who moved to Bath in 1790.